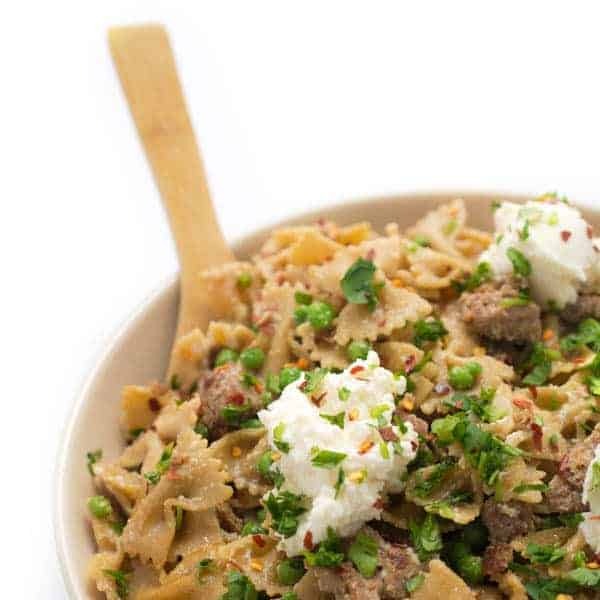 This hearty one-pot pasta meal is filled with whole wheat bowtie pasta, sweet Italian turkey sausage and creamy ricotta cheese. 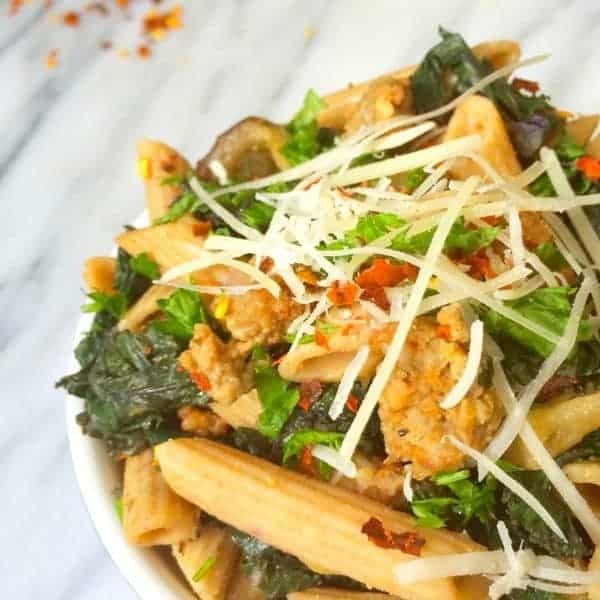 Pasta night is a common occurrence in most homes and for good reason – it’s quick-cooking, affordable and super versatile. While my boys are pretty good eaters, they are definitely are the most picky at dinnertime than other meals of the day. 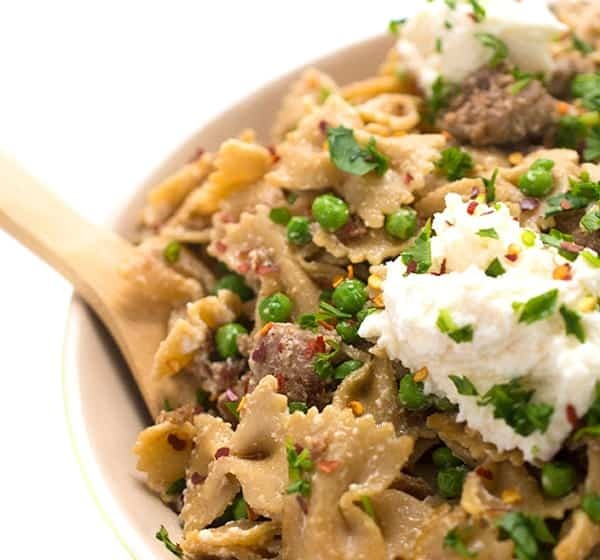 One dinner I know will always be a hit is a dish with plenty of pasta, meat and bright green veggies like peas. Throw in two types of cheese to the mix? I know it’ll be a guaranteed home run. 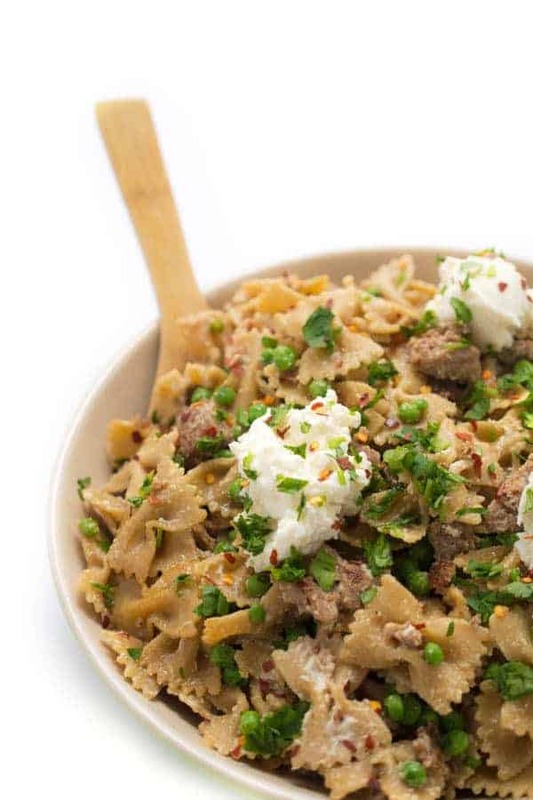 This comforting one-pot pasta meal is made with whole wheat bowties, sweet Italian turkey sausage, creamy part-skim ricotta and sharp parmesan cheese. 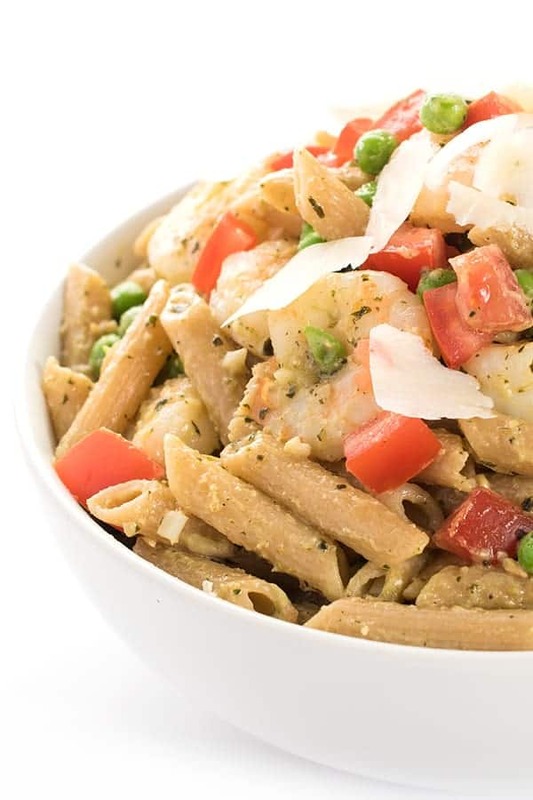 When the ricotta is tossed with the parmesan cheese and warm pasta, it turns into a rich and creamy cheese sauce that is much lighter than traditional pasta sauces. 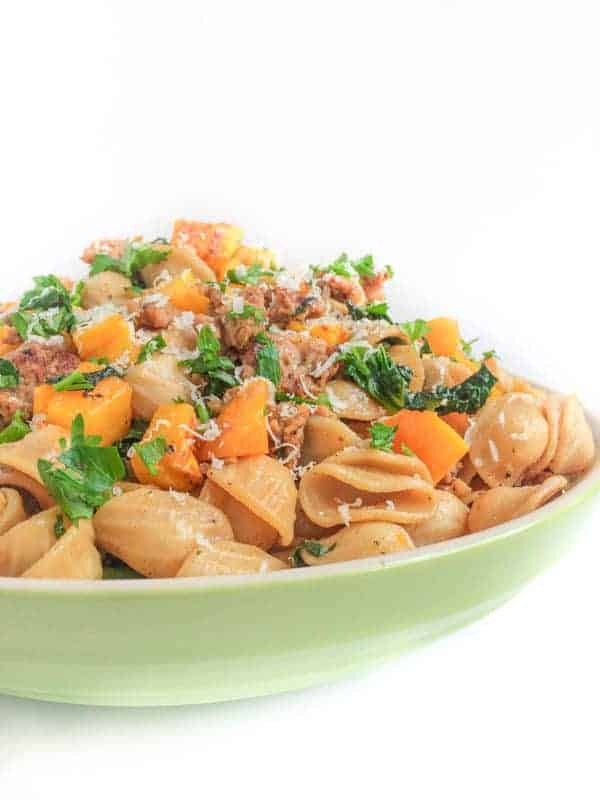 Leftovers taste even better the next day so be sure to double the batch for a quick re-heatable lunch or dinner later in the week. What is your favorite affordable, go-to dinner recipe? I’d love to hear from you. Prepare pasta according to package instructions reserving 1/2 cup of the cooking liquid. Pre-heat a large deep skillet over medium-high heat and spray with cooking spray. Cook sausage until a golden brown crust forms and meat is fully cooked through, about 7-9 minutes. Add garlic and green peas to the pan and heat until warmed through, about 2 minutes, stirring frequently. Stir in reserved cooking liquid from pasta, parmesan cheese and olive oil. Add cooked pasta to the pot and toss well. Heat until warmed through, another 4-5 minutes. Remove from heat and stir in fresh minced parsley. Check for seasoning and adjust accordingly. Pour pasta into a large serving bowl or between four large pasta bowls. Dollop each with 1/4 cup ricotta cheese and garnish with chili flakes and extra parmesan cheese to serve. For more Healthy and Easy Dinner Ideas check out Pinterest! YUM!! This has dinner tonight written all over it! hey girl- this looks so good!! I love pasta to! I have a couple. One is a pasta/tarragon/lemon/broccoli/chicken combo and another is white beans, chicken sausage, and sweet potatoes. Have you ever made your own ricotta? Oh my gosh that sounds AMAZING! And no i haven’t!! Is it easy? I haven’t tried it, but my sister did and she said it was easy and super delicious. Ummm yes girl it is!! This looks so easy and good! I can’t wait to try it. Super easy sista! 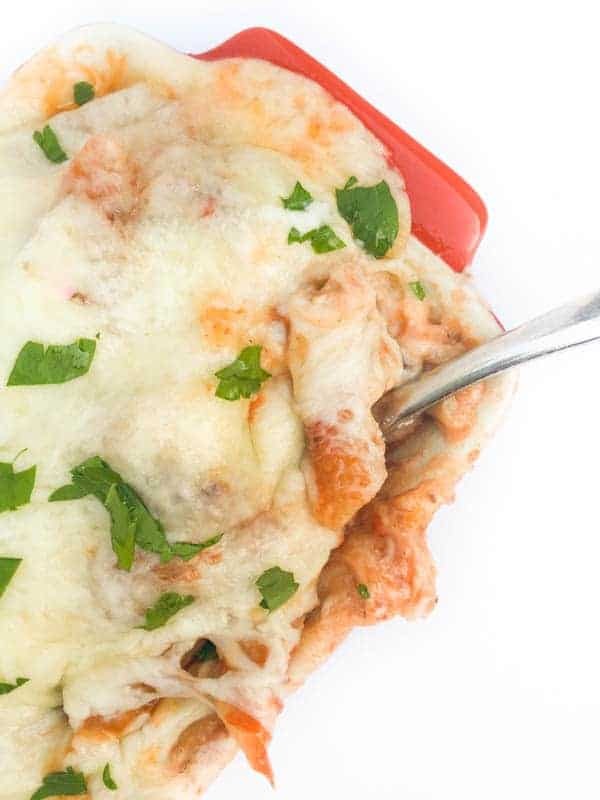 Your family would love it- great for feeding a crowd too and leftovers are even better for lunch. I love whole wheat pasta. Some people don’t but I think it is so good. I prefer it! Especially DeLallo brand!